I have another wacky fusion recipe for you! 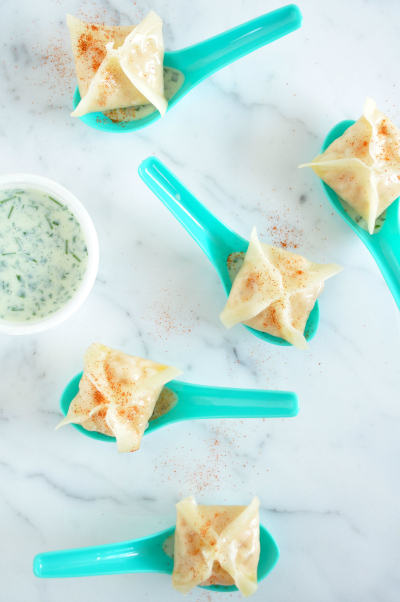 This time it’s Asia meets America with a buffalo chicken dumpling. The dumplings are soft and a little sweet with a kick of chilli. Combined with the ranch-style dip, they make the perfect pre-dinner snack. Process the chicken, chilli sauce, butter, garlic, vinegar, honey, cayenne and egg until well chopped. Place a heaped teaspoonful of the mixture onto the middle of a wonton wrapper. Brush the edges with water and gather together to form a point. Press the edges to enclose. Repeat with remaining wrappers and mixture. Line a large bamboo steamer with a circle of baking paper, with slits cut into the paper to allow steam through. Heat over a frying pan of simmering water. Cook the dumplings, in batches, for 6 minutes or until cooked through. Sprinkle with extra cayenne. Serve with the creamy herb dip. For the creamy herb dip, process all the ingredients together until well combined.